Home Career Tips Do you know Salary of President of India & Other Perks? 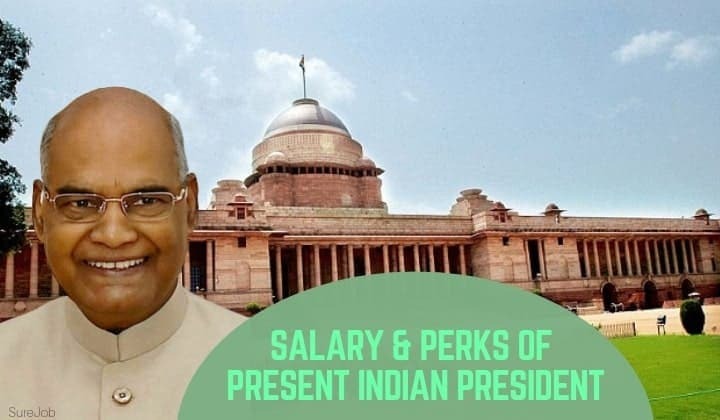 Do you know Salary of President of India & Other Perks? The President of India is an office that came into existence in 1950, when the country formally adopted the Indian Constitution to become a republic. The President of India is the first citizen of this country. Ram Nath Kovind is the present Indian president. Though Indian residents are titular heads of state, they are invested with several powers. Prime among these is to defend the articles enshrined by the Constitution of India. Other than defending and implementing the articles of Indian Constitution, the Indian president also has several other roles. Supreme Commander of Indian Armed Forces: Meaning, the President of India can declare war, peace or truce with any country. The Indian president can also utilize this power to decide on deployment of weapons and military at any location within the country or its land, maritime and aeronautical boundaries. Judicial Powers: The Indian president can revoke or uphold a death sentence or seek judicial intervention in any case where the Constitution of India stands violated. Financial Powers: Any law, act or bill that affects financial security of the nation and its citizens has to be ratified by the President of India. Diplomatic Powers: Every economic, military, cooperation or other treaty/ agreement/ convention or international document endorsed by the Indian government is done on behalf of the Indian President. Executive Powers: To assist the Indian government in passing various laws and bills for benefit of the country and its citizens in accordance with the Constitution of India. Appointment Powers: The Indian president has a right to appoint persons to key posts. The Prime Minister of India is appointed by the Indian president after a political party designates one of its elected members to the post. The president can also appoint other senior officials including Indian diplomats. All Indian passports are issued under the name of the President of India. A small legend requests foreign governments to allow your entry into their territory and safeguard your interests in the name of the Indian President. Given these myriad tasks, the President of India is entitled to receive salary and perks commensurate with duties and status. Here are some interesting facts and figures about the salary of Indian President. The First President of India, Dr. Rajendra Prasad was given a basic salary of Rs.10,000 per month, plus allowances. He took only 50 percent of the salary, saying the amount was sufficient for his family and himself. Following a bill passed by the Indian Parliament in mid-1970s, the basic salary of Indian President was increased to Rs.50,000 per month, plus allowances. In mid-1990s, the basic salary of Indian President was raised to Rs.150,000 per month. According to American website, Payscale.com and various other sources, the total monthly remuneration of the President of India stands at Rs.15.5million. This income is calculated on basis of various allowances paid by the Indian government. Allowance for maintenance of Rashtrapati Bhavan, New Delhi- the presidential residence. Salaries paid by the Indian government to bureaucrats, assistants and menial staff employed specifically for the President of India to perform duties and assist the presidential household. Token salaries paid by Indian government ministries and departments where the President of India is the main office bearer. Free car with chauffeur for Indian President and family. Personal security cover for Indian President and family. Expenses on official foreign tours taken by President of India to promote relations with other countries. Medical and other benefits paid to Indian President and family during tenure. Bonus from Indian government, paid in accordance with laws for state employees. However, figures indicated by Paycale.com may not be completely accurate since lots of information is missing. While the Indian President gets myriad allowances, the official basic salary stands at Rs.500.000 per month. This brings us to the question whether the President of India is overpaid or underpaid. This depends on your perspective. About 23.6 percent of this country’s population lives on less than US$1.25 (Rs.100) per day, according to Census of India 2011. Given this scenario, the President of India would seem to be a very wealthy person who earns and owns a fortune. In stark contrast, a fresh graduate from Indian Institute of Management (IIM) Ahmedabad earns median salary of Rs.200,000 per month plus perks. Engineers of Indian Institute of Technology get an average Rs.150,000 per month plus perks as salary. Hence, a salary of Rs.500,000 plus perks for this important office of Indian President is more than justified. After all, the President of India plays several key roles in governance of this country, despite being the titular head. Duties performed by the President of India cannot be entrusted to any other senior government official, including the Prime Minister. Given US Dollar to Indian Rupee exchange rates in mid-October 2018, the President of India gets annual salary of US$81,311, excluding perks. His American counterpart gets five times more- US$400,000 per year, without perks. Interestingly, the Indian Prime Minister ranks ninth on the list of world’s highest paid heads of state. However, it is worth remembering, the Prime Minister of India is the democratically elected head of the Indian government. It is not a titular position. Remember, the Indian President does not keep all the income. Indian presidents actively donate to charities in the country and other worthy causes. The nature of a President of India’s job is rather stressful: it involves handling all elements of governance in collaboration with the Prime Minister and the ruling government. There are some initiatives such as declaring a national, economic or external emergency that only the Indian President can take. Hence, the salary of Indian President of US$7,000 or so per month or about Rs.500,000 is more than justified. I think its a good things that the salary of the president of india increases, because it indicates that their country is improving, but I guest its too high, the salary difference between the last president, maybe its upon to the president if he had a good deeds, he was elected to serve not to be serve but they deserve it too.